The bat silhouette on the gable. The Bathouse on the campus of the University of Florida is not the most noteworthy project to come out of this office, but the story behind the bathouse is quite interesting. The University of Florida, Bathouse, has watched vigil over Lake Alice on UF's campus for the last 10 years. Originally, the bats lived in the attic of Johnson Hall, which, years ago, burnt down; leaving bats the entire campus to call home. But UF did not put out the welcome mat. Eventually, the bats had made a home out of the tennis stadium bleachers. The University of Florida's Athletic Association needed to evict them somehow. The bats just happened to roost, if bats actually did roost, right above general concessions leaving less than pleasant evidence of their presence. To those it concerned, the bats needed to go. However, due to their beneficial nature as Mother Nature's insect exterminators, this would prove a difficult task. They are protected by the state as a vital link in the food chain--not to mention, Gainesville had probably, unknowingly, grown quite accustomed to having a less than average insect population--which would undoubtedly skyrocket if the bats just went away. Clearly, a plan was necessary, and a solution was finally proposed: A new home would be built for the bats. 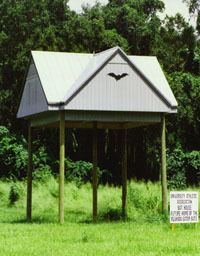 To implement this project only required 2 things: some type of "ideal" bathouse design, and a general cooperation on the part of the bats. The University of Florida Athletic Association assured the necessary money, but there was no clue how or what to construct for these bats. Enter: Hunter McKellips Associates Architects. Bill Hunter, having consulted a group of experts, came up with a perfect design. In fact, it was big enough to house upward of 400,000 bats. Thus, it was erected, and opened and has been there ever since. But there is more to the story. . .
Its stands that bats would need to know about their new UF home but letting them know would not be easy. The first step required an application of guano all over the underside of the bathouse. The next step required the sedation of the bats and transporting them to the new bathouse. Finally, the bats were put inside the house, where they stayed for one day. But there is still more to this story. . . It turns out that bats were none too interested in being handled by people or to be installed in a building which, although had been frosted with fresh bat droppings, still had that "new-bathouse" smell. The upside was that the bats did not return to their old haunts on campus, but did not return to the bathouse either. The athletic association had evidently erected a 40 foot "bat-scarecrow." But with the bats gone, no one could complain. About a year later, after the smell of humans and construction went away, the bats came back. Today, their number is estimated at 60,000.